On Thursday, January 17, 2019, the Fourth Estate Restaurant at the National Press Club will host a dinner featuring Carla Hall and recipes from her new book. Join celebrity chef Carla Hall of ABC's Emmy Award-winning "The Chew" at a wine dinner Jan. 17 showcasing her just published cookbook, "Carla Hall's Soul Food." The award-winning chef, television personality and food activist explores her Nashville roots and delivers an original take on Southern comfort food, tracing soul food’s history from Africa and the Caribbean to the American South. The Jan. 17 event marks Hall's second appearance at the National Press Club. The previous dinner sold out, so reserve early to avoid disappointment. The five-course wine dinner, which begins at 6:30 p.m. with hors d'oeuvres and cocktails, features 14 recipes from Hall's book. The seated dinner begins at 7 p.m. The full menu for the dinner is listed below. Wine will be announced at a later date. The dinner costs $95 per person and includes a copy of the cookbook. Couples tickets cost $180 with one copy of the book. Club members must be logged in to receive the discounted price of $81 per person, $152 per couple. The Fourth Estate restaurant is located on the 13th floor of the National Press Building, 529 14th Street, NW. Hall, the co-host of the daytime food show, “The Chew,” was a finalist on “Top Chef” and “Top Chef All Stars," and appears regularly on the Food Network. She graduated from Howard University, attended culinary school and was chef in several restaurants before founding her own acclaimed catering business. Hall also serves as the culinary ambassador for Sweet Home Café at the Smithsonian National Museum for African American History and Culture. She lives in Washington, DC. "Soul Food" is Hall's fourth cookbook. Her first book, “Carla’s Comfort Foods: Dishes from around the world,” drew a capacity crowd at a Fourth Estate wine dinner in 2014. The book offers recipes for easy weeknight meals centered on seasonal vegetables as well as rich celebration dishes for special occasions. Single tickets are $95; couple tickets are $180, including all courses, beverages, tax, gratuity. 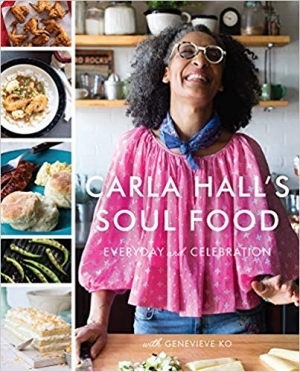 A copy of the Carla Hall's Soul Food cookbook (one per individual person/couple) is included in the price.